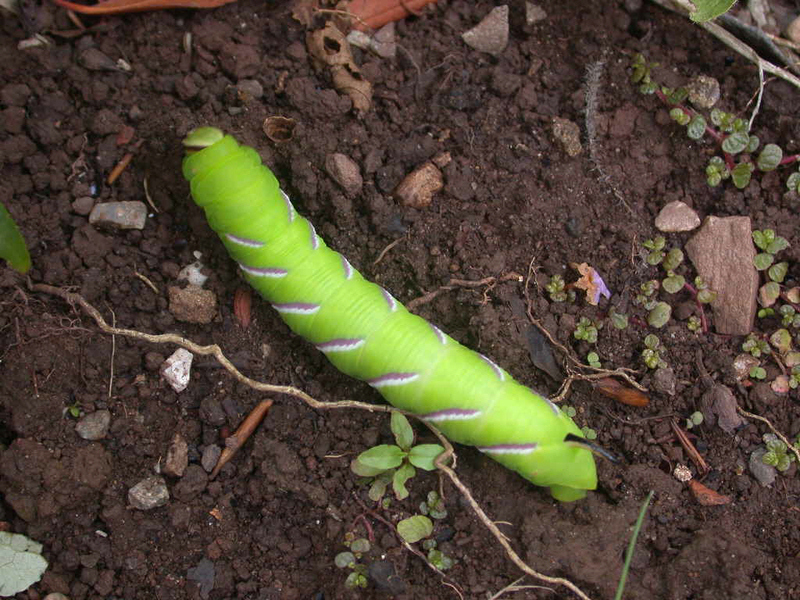 It's a privet hawk moth larvae, where you right? These caterpillars grow into stunning moths that feed on privet, lilac and ash trees and could be in your garden or nearby park. But right now they will be buried deep in the leaf litter in their chrysalis getting ready to emerge next summer as a colourful adult. Moths go through a process called complete metamorphosis just like butterflies. This means that they go through four stages in their life, eggs, caterpillar (larvae), pupae, moth. You can see that the fully grown moths have beautiful pink, striped bodies and hindwings which you think would make them really easily to spot. During the day they hide themselves away, resting on trees or even posts and if disturbed, they will flash their brightly coloured wings to warn off predators. They have a large wingspan of up to 12 centimetres, making them the biggest resident moths in the UK and a tasty snack for many birds and bats! They are only in flight during June and July usually so why don't you go on a night time exploration next summer and see if you can find any?